REPLACE TWO (2) TUNNEL LIGHTING UNINTERRUPTIBLE POWER SUPPLY (UPS) UNITS, ONE (1) IN EACH VENTILATION BUILDING FOR A TOTAL OF TWO (2) UNITS, WITH NEW THREE-PHASE UNITS. THESE UNITS WERE LOCATED ON THE GROUND FLOOR LEVEL OF EACH VENTILATION BUILDING, NEAR THE EXISTING TUNNEL LIGHTING PANEL BOARDS. 9 P.M. AND 5 A.M. FIXED COMPLETION MARCH 24, 2011. DOREY ELECTRIC COMPANY, SUBCONTRACTOR TO SKANSKA USA CIVIL IS PERFORMING THE ELECTRICAL WORK ASSOCIATED WITH THE FIRST PHASE OF THE NORFOLK LIGHT RAIL (NEWTOWN ROAD TO NORFOLK STATE UNIVERSITY). DOREY ELECTRIC COMPANY’S WORK CONSISTS OF INSTALLING TRAFFIC SIGNALIZATIONS AND PROVIDING EMPTY CONDUIT SYSTEMS (approximately 20,000 LF total; various sizes) AND DUCT BANK ALONG WITH JUNCTION BOXES AND MANHOLES FOR USE BY FUTURE CONTRACTS. 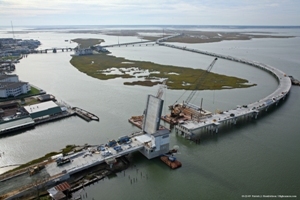 PROJECT BEGAN JULY 2008 AND IS SCHEDULED FOR COMPLETION NOVEMBER 2009. DOREY ELECTRIC COMPANY, SUBCONTRACTOR TO BRANSCOME INC. IS PERFORMING THE ELECTRICAL WORK ASSOCIATED WITH THE EXTENSION OF COMMANDER SHEPARD BOULEVARD IN HAMPTON. DOREY ELECTRIC COMPANY’S WORK CONSISTS OF INSTALLING TRAFFIC SIGNALIZATIONS, ROADWAY LIGHTING AND OVERHEAD SIGNS AND STRUCTURES. THIS CONTRACT ALSO INCLUDES AN UPGRADE TO THE CITY’S TRAFFIC MANAGEMENT SYSTEM. 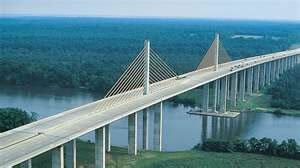 PROJECT BEGAN JULY 2008 AND IS SCHEDULED FOR COMPLETION DECEMBER 2009. DOREY ELECTRIC COMPANY, SUBCONTRACTOR TO AMERICAN BRIDGE FOR THE ELECTRICAL WORK RELATED TO THE OPERATION OF A NEW ¾-MILE (4,035 FOOT) SINGLE LEAF LIFT SPAN BRIDGE INCLUDING BRIDGE CONTROLS, TRAFFIC SIGNALS, UNDERBRIDGE MOUNTED TELEPHONE CONDUIT SYSTEM, SWITCHGEAR (INCLUDING FEEDERS), NAVIGATION LIGHTS, LIGHTNING PROTECTION, ROADWAY LIGHTING, SUBMARINE POWER AND CONTROL CABLES, SPECIAL SYSTEMS AND STANDBY GENERATOR. 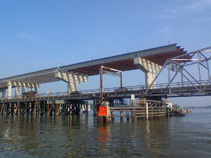 PROJECT BEGAN IN 2007 AND IS SCHEDULED FOR COMPLETION NOVEMBER 2009. DOREY ELECTRIC COMPANY, SUBCONTRACTOR TO SKANSKA USA CIVIL, IS RE-ROUTING EXISTING POWER AND CONTROL WIRING FOR EXISTING SWING-SPAN BRIDGE, REMOVING EXISTING POWER AND CONTROL WIRING FOR CONSTRUCTION, AND INSTALLING CONDUIT, WIRE AND NAVIGATION LIGHTS FOR THE NEW BRIDGE.